Cooker hobs become coated in food, oil splashes, and general dirt and grime all too easily. 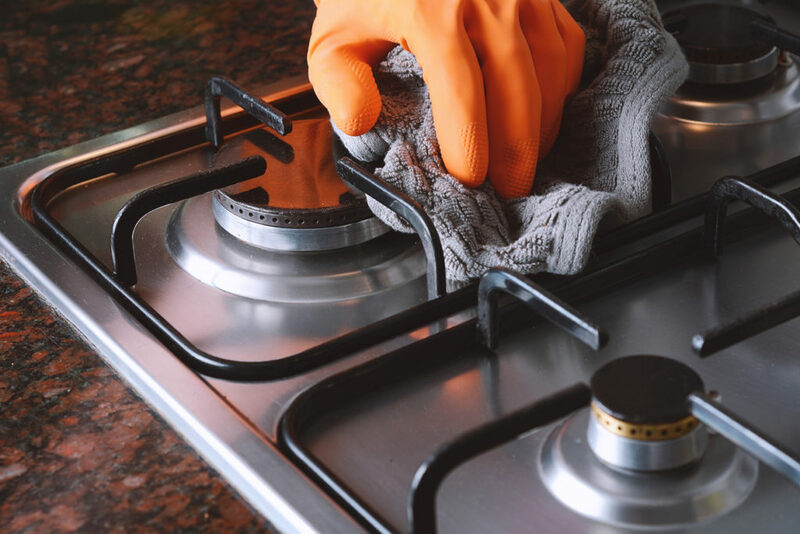 In order to maintain your gas hob and keep it at its best for years to come, you should expect to maintain it daily as well as giving it a deep clean every few weeks or after cooking a messy meal. Having a clean stove top can drastically improve the appearance of your kitchen, as well as keep bacteria and house flies at bay. Whether you live in rented accommodation or are a home owner, it’s important to maintain your cooker hob properly in order to prolong its life. A dirty hob can exacerbate already existing problems, such as gas burners that won’t stay lit or turn off, and a cooker hob fault where the flame cannot be controlled. The following steps should help you on the way to having a sparkling kitchen and well-maintained appliances. A common occurrence with burners is that food splashes that aren’t wiped off immediately can get burned on to them. Be sure to clean your burners in the case of a big spill and as part of a scheduled cleaning routine. Once or twice a week for a small household should be enough. After each use, check that there is no food debris that will block the gas flow. You can do this with a dry brush but ensure it’s not wet or you will risk damaging the ignitors. As part of a weekly cleaning routine, run hot soapy water, and allow the grates to soak for a few minutes, dislodging burned food which should come free from the metal when you go over it with a cloth. You can even soak burners in hot soapy water, and if they’re especially dirty use a half water, half vinegar solution for a few hours. Be careful not to get the starter on your hob wet, otherwise it may need replacing. There’s often a build-up of crumbs and small bits of food and seasoning on the tops of stoves after cooking. Sauce and water also often overboil leaving splash marks on the metal of the stove top. Using a lid on your pots and pans can be a good way to stop splashes getting on your surfaces, along with paying attention to the temperature your food is cooking at. You can clean your stove top quickly by using a nozzle on the vacuum and sucking up the small particles, before using a cloth, water, and kitchen cleaning spray to properly clean and disinfect the surface. It’s important to not flood your cooker hob with water or any type of liquid, as the burners can flood causing the ignition to break. Eventually, it will dry out, but if you feel that it requires immediate attention, don’t hesitate to contact Glotech for gas hob repairs.